Saint John’s Hospital (Sint-Janshospitaal) was founded in the 11th century to care for needy pilgrims passing through Bruges. The complex expanded over the centuries adding a monastery, convent and pharmacy. As you can see from the historic image below, the main hall was incredibly busy with little sick bays along the architectural elements. The hospital hall has been converted into the museum and there is an eerie similarity between image of the active hospital and the structure today. Works on display in the Hospital Museum. One aisle of the hall chronicles those who worked in the hospital and displays a nun’s habits, terrifying medical devices, “plague cures” and portraits of very earnest 18th century physicians. 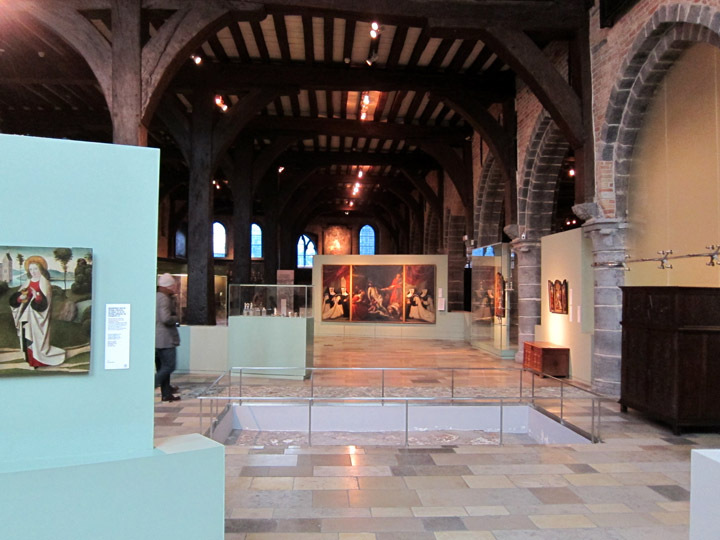 Another section displays art commissioned by the religious communities of Bruges which was consolidated here following Napoleon’s reign. Subject matter, style and period vary wildly among these paintings. 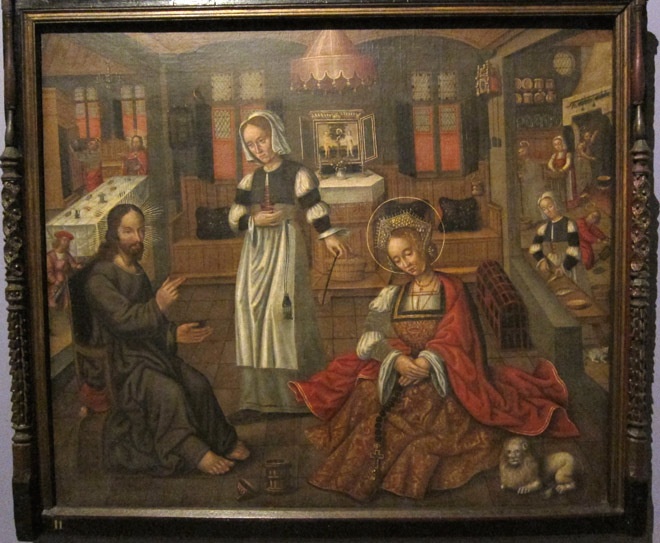 Late 16th/early 17th century anonymous work “Christ in Bethany with Martha and Mary”. This is an incredibly detailed and slightly weird painting that probably deserves a post of its own. 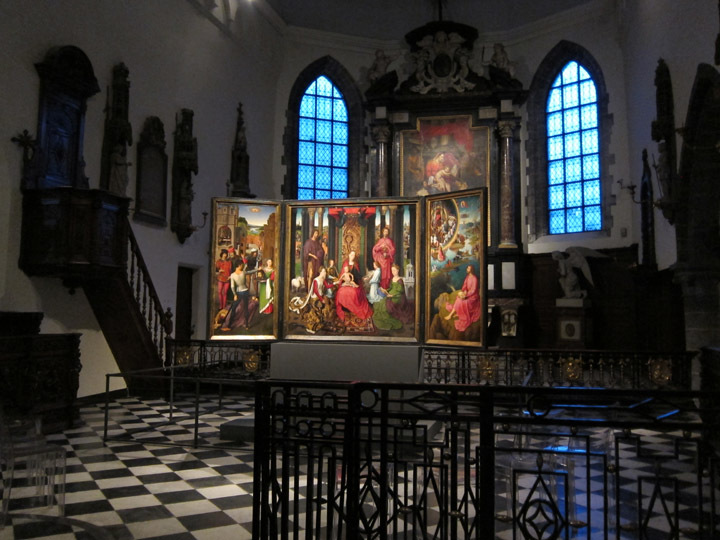 The “Memling Museum” is really just the hospital church and narthex which is open to the rest of the hospital hall. It’s a silly distinction but a lovely collection! 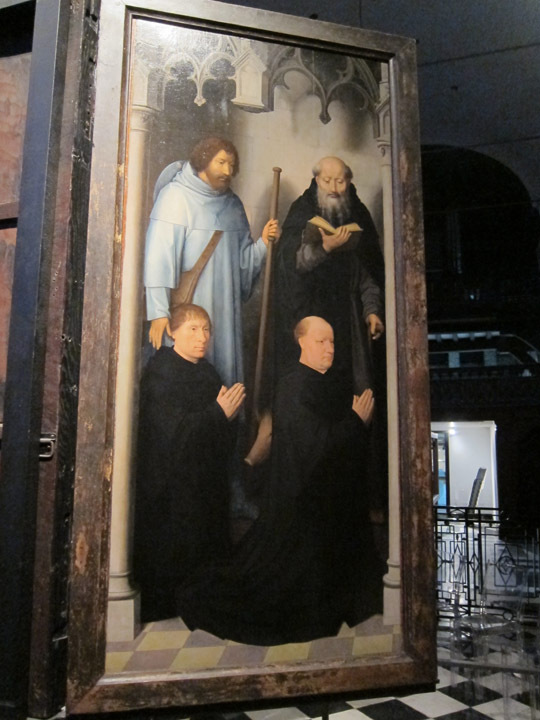 German-born Hans Memling came to Brussels to work with Rogier van der Weyden and then moved on to Bruges in 1465. He was very popular gaining commissions from religious communities, social groups, individuals and foreigners. At one point Memling appeared on city tax records as one of the wealthiest men in Bruges. Chapel-shaped “St. Ursala Reliquary” (1489) by Hans Memling. The end painting showing St. Ursala protecting the virgins whom she took on a pilgrimage from Cologne to Rome. 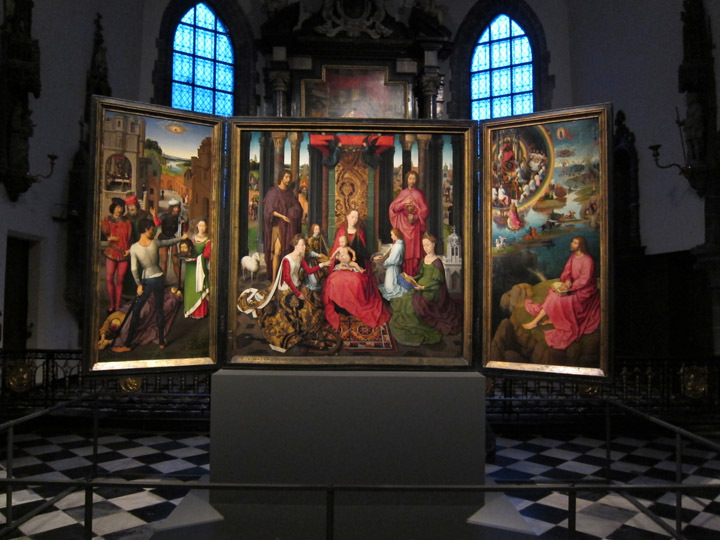 In 1479 Hans Memling completed the St. John’s Altarpiece which had been commissioned to hang in the Hospital Church. Despite the female saints beside the Virgin in the central panel, the piece is actually dedicate to the two patron saints of the Hospital. The left panel shows the beheading of St. John the Baptist. On the right there is a rare image of St. John the Evangelist observing a vision of the Apocalypse at Patmos. The open altarpiece is brilliantly colored and incredibly dramatic in the black and white Baroque Church interior. Hans Memling’s “St. John’s Altarpiece” on display in the Hospital Church. The altarpiece is exhibited in the round so that you can enjoy the outer door decorations. Like all triptych, the piece would have been usually displayed in the closed configuration. 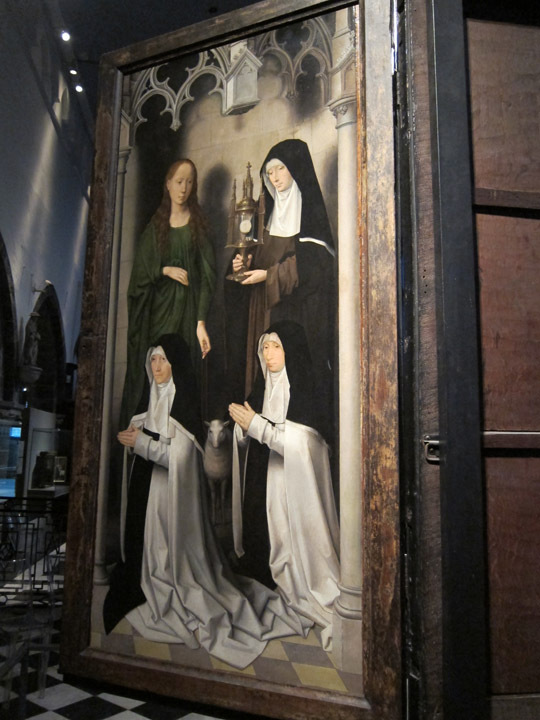 The outer two panels show the Abbesses and Chaplains of the Hospital who commissioned the altarpiece along with their patron Saints. Outer door depicting the Abbesses and their patron Saints. 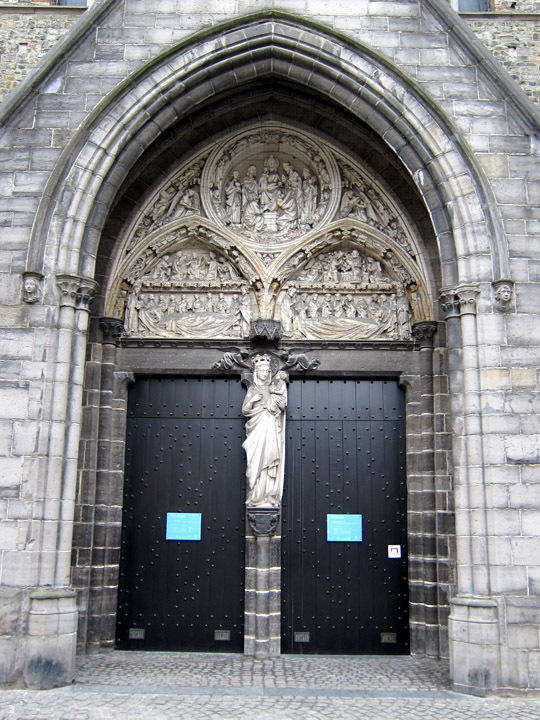 Outer door depicting the Chaplains and their patron Saints. The luminosity of color, intricate detail and hidden brushwork is characteristic of Memling and the Flemish Primitive style. 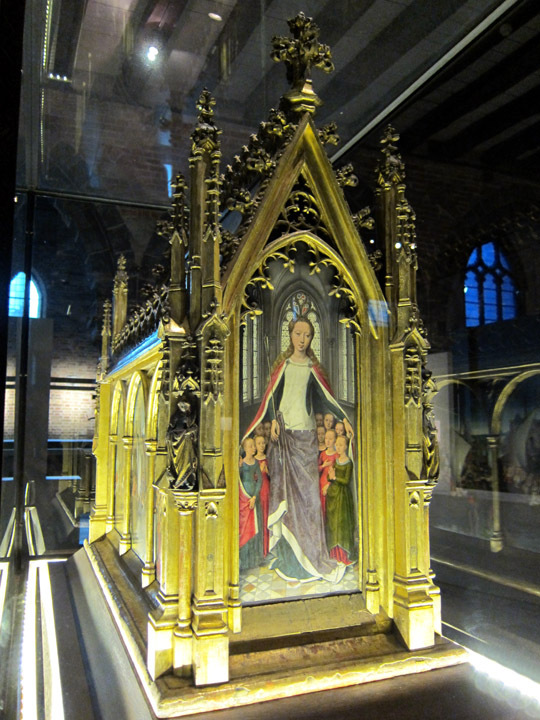 It is rewarding to examine the St. John’s altarpiece up close and then step back (or take a seat) and soak it all in. 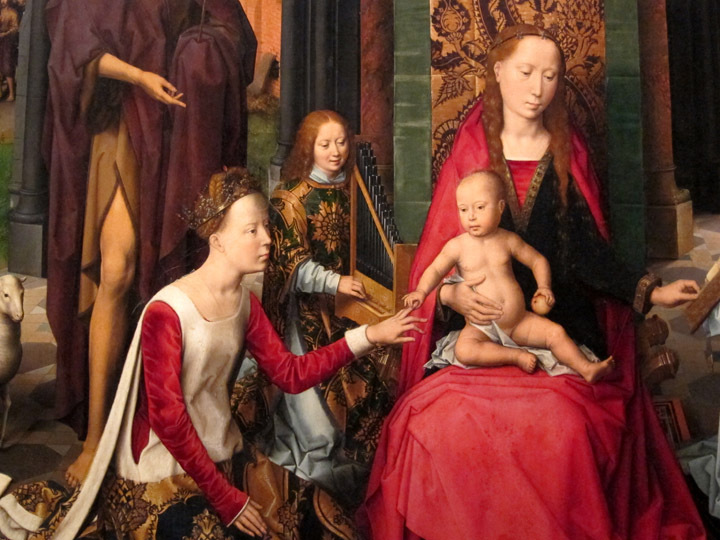 The Memling Museum has done an excellent job exhibiting this masterpiece. Detail of the mystic marriage of St. Catherine of Alexandria from the central panel of the St. John’s Altarpiece. St. John the Baptist can be seen over Catherine’s shoulder. For directions and opening hours, check the museum’s website, then look for this petite but elegant doorway. The hospital is literally across the street from the Church of Our Lady (which houses a statue by Michelangelo) so it is very easy to miss this museum if you’re not looking for it. What a fascinating history and museum but those plague cures have me shaking just a little. I am glad to see that so much of the past is preserved forever and I am relieved that they converted the buildings rather than allow them to succumb to disrepair. My favorite pieces are the St. Ursala Reliquary and the triptych, and I agree that the latter’s vibrant colors looking stunning in its black and white background. Great post and full of wonderful information too! Thanks Jeff! This museum just looks like another beautiful stone and brick building but has some real treasures inside. It’s amazing how much there is to see and do in Bruges! I definitely underestimated just spending a day there – should have stayed longer! 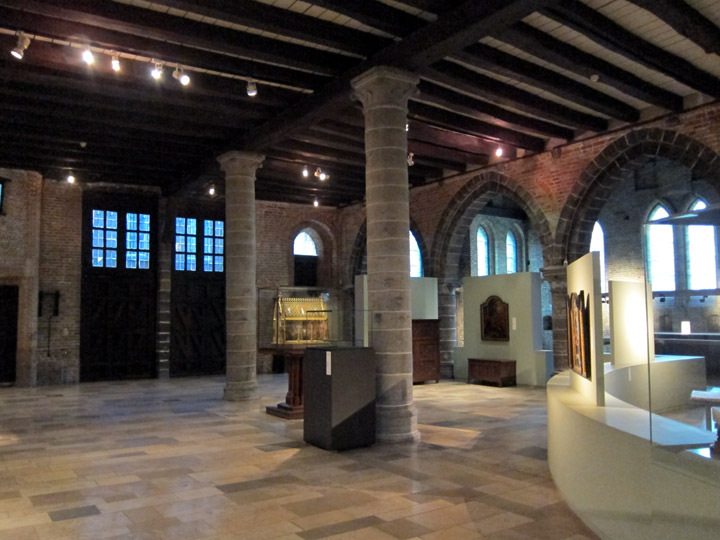 MY wife and I had a wonderful time exploring the old hospital when we were in Bruges. It is amazing that the building has lasted so long. It is also wonderful that it still is in use although not as a physically healing establishment.